Members of the LGBT community and other supporters of a fairness ordinance packed Bowling Green City Hall during the city commission's Feb. 21 meeting. Supporters of what's known as a fairness ordinance will lobby the Bowling Green City Commission Tuesday evening. Members of the LGBT community and others will speak during a work session following the regular city commission meeting. No action can be taken, but proponents will be allowed to address city leaders. The fairness measure would update the city’s civil rights ordinance to include protections for sexual orientation and gender identity. A fairness ordinance would prevent discrimination in housing, employment, and public accommodations. Commissioner Slim Nash introduced the ordinance during the commission’s February 21 meeting. The motion wasn’t seconded and died without any discussion. Nash says he hopes the work session will allow for an open discussion and exchange of ideas between fairness advocates and city leaders. "While many citizens have attended and spoke during the public comment portion of commission meetings, that does not allow for an exchange, rather it is designed only for one-way communication by the citizen to the commission without interruption or response," Nash told WKU Public Radio. Bowling Green is Kentucky’s largest city without a fairness ordinance in place. Update: The effort to pass a fairness ordinance failed to receive a vote at Tuesday's Bowling Green City Commission. You can read about that here. When the Bowling Green City Commission meets Tuesday, it will be a historic moment for members of the LGBT community. For the first time, a fairness ordinance will be on the agenda that would make it illegal to discriminate against someone because of their gender identity and sexual orientation. Members of the local LGBT community and supporters have spent years making speeches, delivering petitions, and holding rallies in support of extending civil rights protections to individuals based on their gender identity and sexual orientation. Commissioner Slim Nash is fulfilling a campaign promise by introducing the ordinance. Nash’s proposal before the Bowling Green City Commission would add lesbians, gays, bisexuals, and transgender individuals to the city's current law that prohibits discrimination based on race, religion, age, color, and nationality. Bowling Green will not become the next Kentucky city to enact a fairness ordinance that would have banned discrimination against the LGBT community. The measure failed during a city commission meeting Tuesday afternoon. 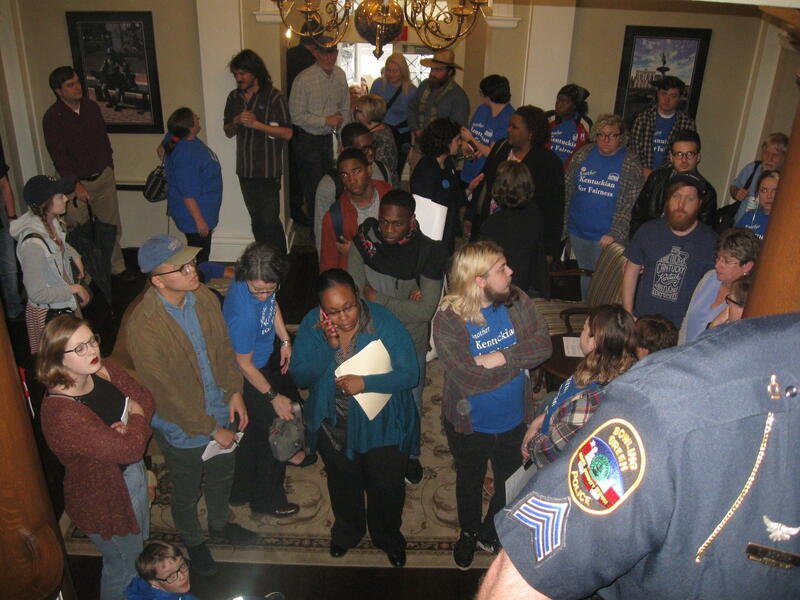 Supporters of the fairness ordinance chanted ‘shame’ when no other commissioner made a second motion to approve the proposed ordinance introduced by Commissioner Slim Nash. The measure would have extended civil rights protections to the LGBT community in areas such as housing and employment. Liberal state lawmakers have for 16 years pushed for a bill that would amend Kentucky’s civil rights code to protect people from discrimination in the workplace, housing and other areas based on their sexual orientation. Dubbed the fairness bill, the measure has gotten considerable attention from the press and advocates each year it’s been proposed, but it hasn’t ever gotten traction in the legislature. But in the wake of the shootings at a gay nightclub in Orlando last month, and as several states —including Kentucky — sue the federal government over bathroom guidelines for transgender students in public schools, it doesn’t look like support for the measure is growing in the commonwealth. The fairness bill has never received an official vote in committee — one of the first hurdles a bill has to overcome on the way to becoming a law — even in the Democrat-controlled House of Representatives. House Speaker Greg Stumbo, a Democrat from Prestonsburg, co-sponsored the legislation in 2014, but this year he has said he hasn’t given it much consideration. Efforts are underway to make Elizabethtown the ninth Kentucky city with a fairness ordinance. The city council will hear a presentation later this month from the Fairness Campaign. Director Chris Hartman says a similar effort failed three years ago, but he’s still optimistic. "Often times it is a tough road to convince elected officials to pick up what they imagine is a controversial issue," Hartman said. "It's a different city council than the one in place in 2012 so we expect the response might be different now." The ordinance would prohibit discrimination in housing, employment, and public accomodations based on gender identity or sexual orientation. Midway became the most recent city to approve a fairness ordinance in June.